RB433L is end of life (EOL). Mikrotik recommends RBM33G for functional replacement. The RB400L is MikroTik's new low cost series. The RB411L has one miniPCI slot and one Ethernet port. Use this device in an outdoor case for a CPE device, or a point to point wireless link installation. 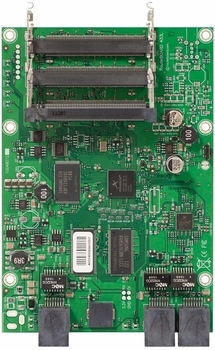 The miniPCI slot allows you to choose your own preferred wireless card model. It’s powered by an Atheros 300MHz CPU and has 32MB of RAM and a Level3 RouterOS license.